I haven’t posted about my work in a while and seeing as I’ve been doing lots of it recently, I have a lot to talk about. Starting with this shoot. As I’ve slowly begun to enter the realm of performance art I have had to become increasingly aware of location in relation to my body. Where I place myself is just as important as the actions I carry out in the space. So I’ve been looking into site-specific art and reading various takes on the notion of the ‘white cube’ gallery space; how does placing your work within four white walls limit it? Does this impose an unwanted constrain? It depends on the work of course, some pieces thrive in a gallery setting, others need to expand beyond that. So this is what I’m playing with here. It was an instinctive decision to take my work to a natural based environment in place of the studio. Taking it to other buildings and artificial places such as shopping malls or car parks bring in too many connotations of capitalism and commercialism. Not my intentions by any means. Nature on the other hand sits well alongside my focus on the human body. So when I was back home I took myself to the gardens near my house and played around with the ideas of the artificial within nature and the obscurity of self. I’d actually forgotten that the bridge was painted blue and was really struck by how it stuck out in among the otherwise natural landscape. 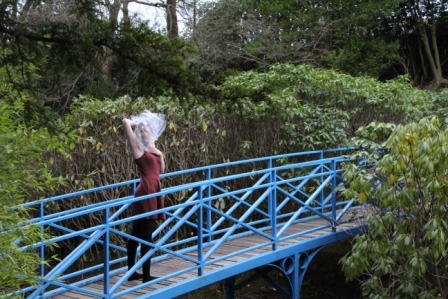 It was actually the bridge my parents had their wedding photos taken on so as well as complimenting the intentions of my shoot, it also holds a historical attachment for me. This brings in the element of time which I have been looking at a lot recently, particularly in terms of viewing it as a medium and artistic concept in itself. There are several layers to my exploration of time in my current work which I won’t go into in depth, but a very simple aspect of it in the case of these photos is simply my choice of clothing; it’s very much a 1960s style dress which reverts back to a past era. Time also comes into play when we photographed in the graveyard. There are a lot of things present in this, most obviously is the sensitivity of photographing in such a sacred place. Respect is something therefore that plays a big part in this as I was not wanting to be disrespectful in any way. Instead, I wanted to bring out the beauty in a place that is more often associated with grief and pain. Given the conventional associations of a graveyard, it was quite difficult to avoid what felt like an eerie scene. Unlike the gardens which were bursting with life; where there were children playing on the swings, ducks swimming in the pond, water flowing, etc. There were also a lot of people wondering the gardens as we were shooting. In contrast to the gardens, the graveyard was empty; completely devoid of life. This felt very poignant as the two settings both reflect what it is they represent. The graveyard was quiet with nobody present, apart from the deceased. Whereas the park was full of youth and water. Water of course is the key to life and represents vitality. It is also another thing alongside time that I have been studying. So although from the outset the shoot kind of looks like I plonked myself in two settings for effect, that is not the case. They are highly considered. Nothing in my work lacks purpose, because otherwise I do not see the point in creating it. By formulating something with meaning, it allows the work to be more emotive and therefore better received. Or at least I hope so as emotive art to me is the most touching and consequently, the most effective.